High protein, low-carb bars with real dark chocolate coating. If you’re looking for high quality protein during the day to support your lean muscle goals, Maximuscle’s Promax® Meal bars will provide you with a superb 21g of protein per 60g bar. Most protein bars are much bigger, requiring you to consume far more calories to get the same amount of protein. Promax Meal bars provide you with easy to digest protein when you need it, whether it’s during the day at lunch, after the gym or on the train home. 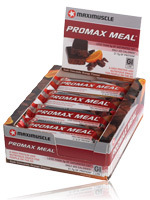 They are ideal to take as a recovery bar and result in faster muscle refuelling than eating carbohydrates alone. Each Maximuscle Promax Meal Bar is tested to be officially low GI, low carb, high in fibre, and gives you that much needed “full feeling” that normal confectionery bars don’t. Perfect for your gym bag, at work or in the car. With 2 superb flavours, you’ll never get bored of the taste either! Many of the U.S. bars do not add Glycerol as a carbohydrate, even though it is a legal requirement to list Glycerol as a carb in the U.K. & U.S. Promax Meal bars, when compared to correctly labelled U.S. bars, are one of the lowest carb bars you can buy! Do not be fooled by illegal labelling.